Don’t the Thai women look like dolls with those colorful Thai umbrellas? I personally think it is the Umbrellas that enhance their looks. In fact, I think these Chiang Mai Umbrellas brighten up every corner they occupy. 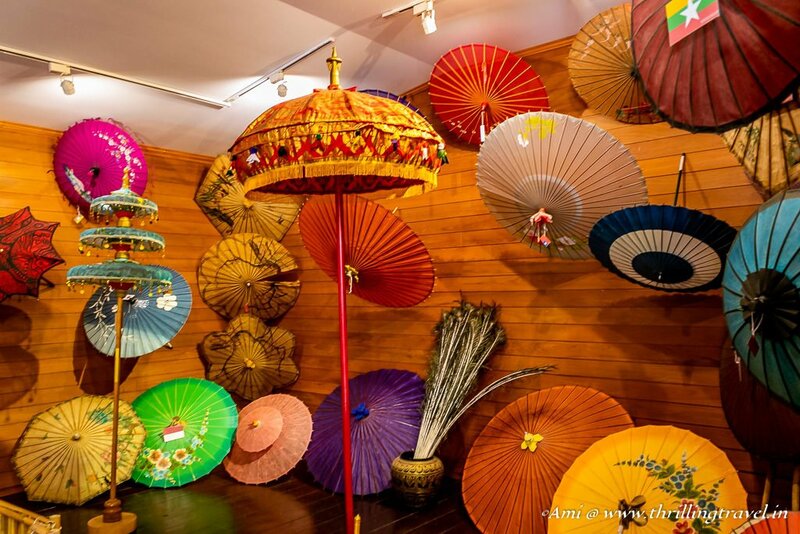 The pretty Parasols are actually heritage handicrafts made in the Bo Sang Umbrella Village in Chiang Mai, Thailand – one of the key Chiang Mai Attractions. 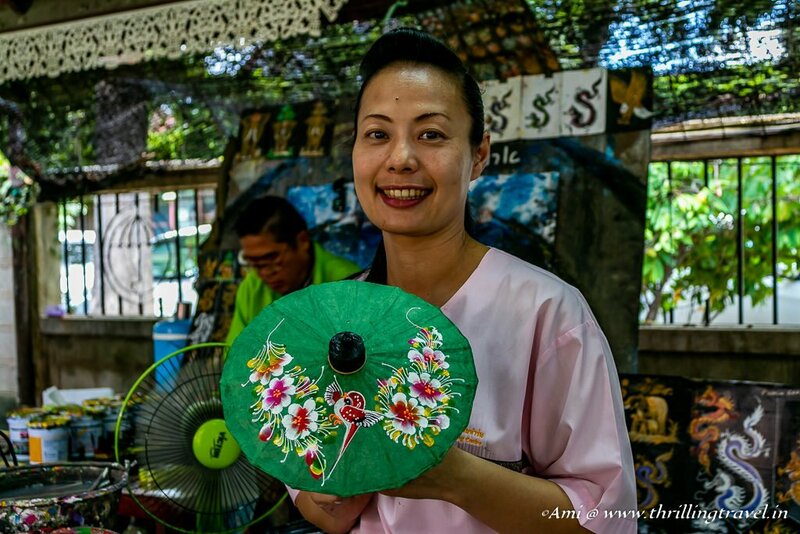 Most travelers visit the Bo Sang village – not just to buy these but to participate in the traditional art of making them. I did too! 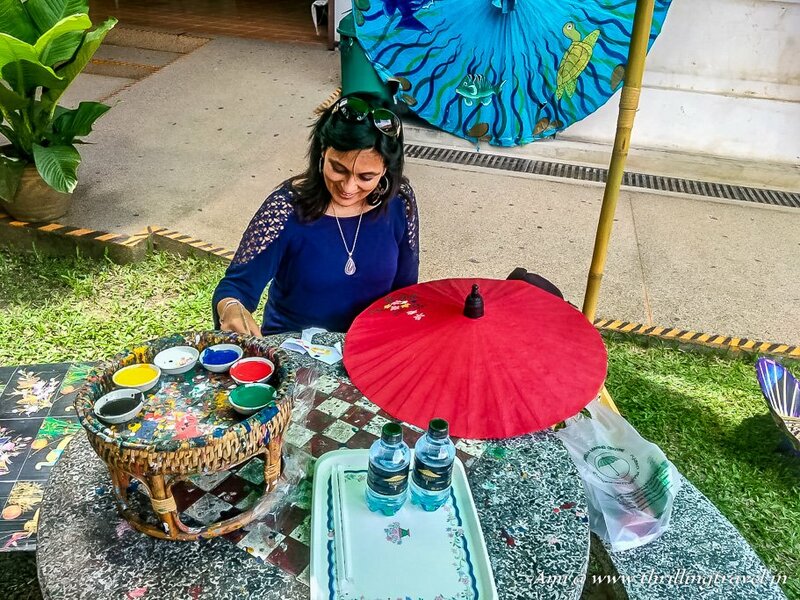 At the Bo Sang Umbrella Village in Chiang Mai, I not only got to interact with the villagers involved in the art but also, managed to get involved in making them. It was truly astounding to discover the labor that goes into making one umbrella. What is also, remarkable is how this art has been kept alive by the villagers for over centuries. 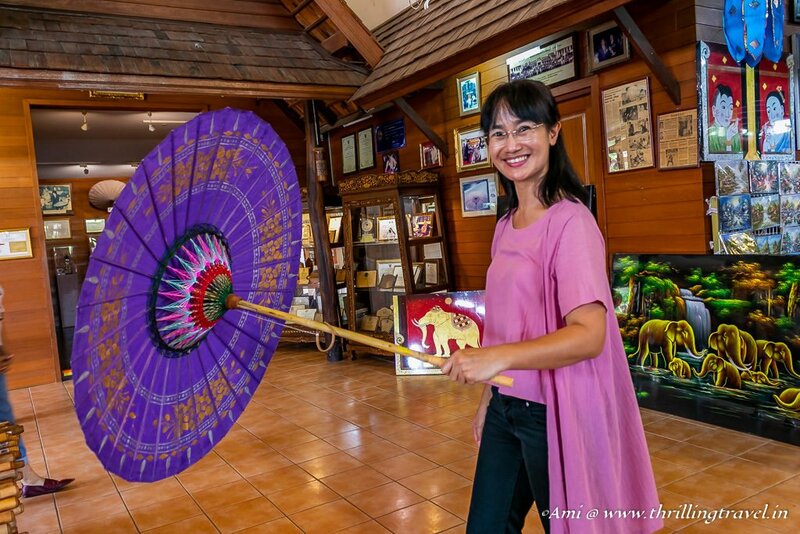 It is this story of the Bo Sang Umbrellas – from its origin to current practice, that makes a visit to this village one of the key things to do in Chiang Mai. Long ago, a Buddhist Monk – Phra Inthaa who went to Burma to spread his religion. When he was there, he was given a lovely umbrella to shield himself from the Sun. He realized that his home had all the raw materials that one needed to make these umbrellas. He also, realized that teaching his village the method of making these would give his people another source of income. 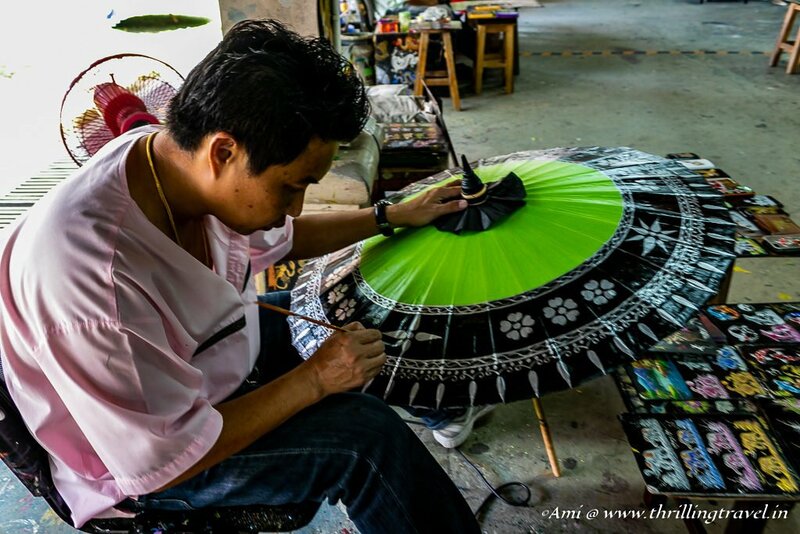 Phra Inthaa learned the art of making these handicraft umbrellas and returned back to Bo Sang (also, called Bor Sang), where he imparted this skill to the villagers. Soon. 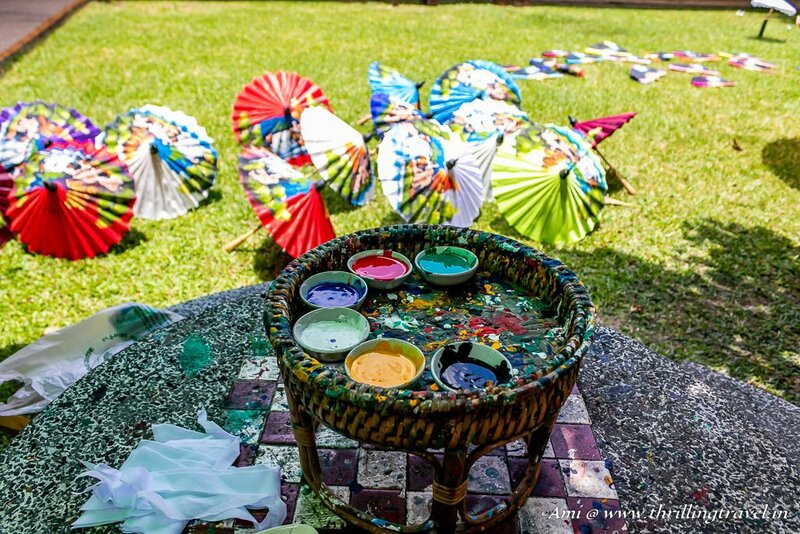 it became a tradition among the villagers to make these colorful umbrellas after they had finished their farm chores. 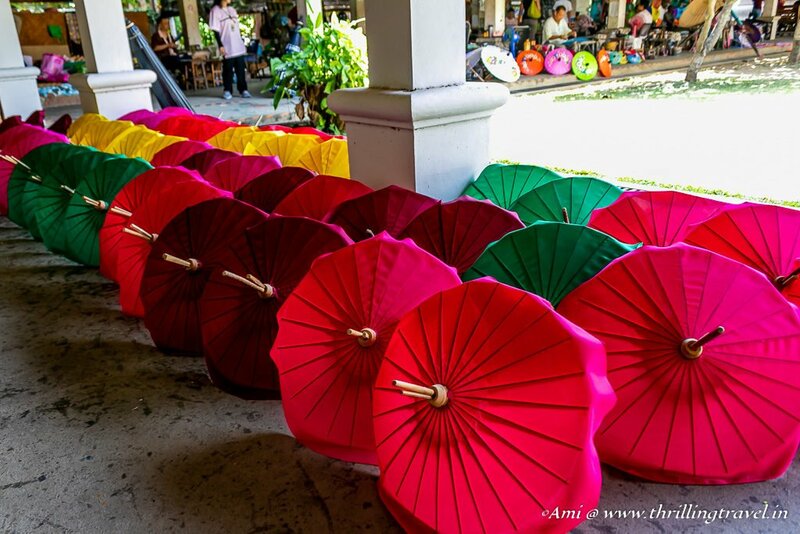 With Chiang Mai being a major trading hub, the umbrellas spread far and wide. Over time, this became a major part of the Bo Sang Village income. 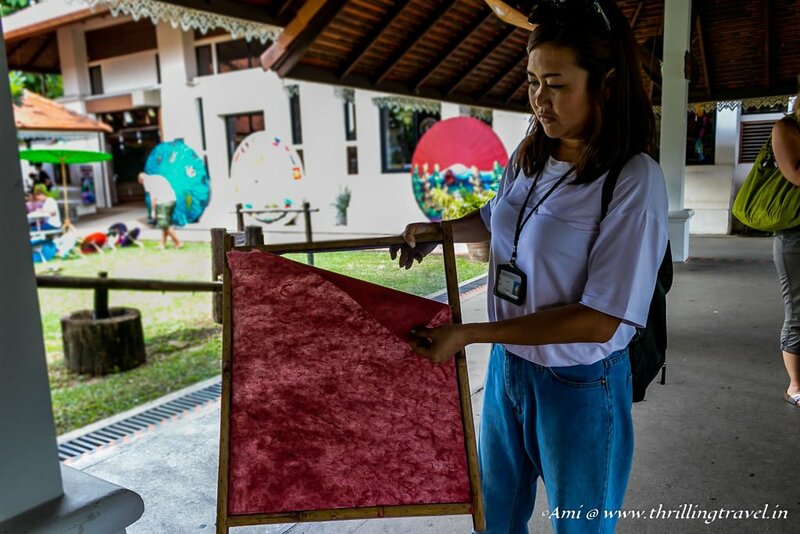 The heritage art of making these parasols was passed on over generations and even today, as you visit the Village, you will find the same families keeping the art alive. A riot of colors welcomed me to the Chiang Mai Handicraft Village. Following a canopy of these colorful umbrellas, I entered a large square bustling with activity. This was the Bo Sang Umbrella Making Center (also, referred to as Chiang Mai Handicrafts Village). Before we embarked on a journey of how the crafty parasol was made, my guide – Nicky – explained what made them so unique. 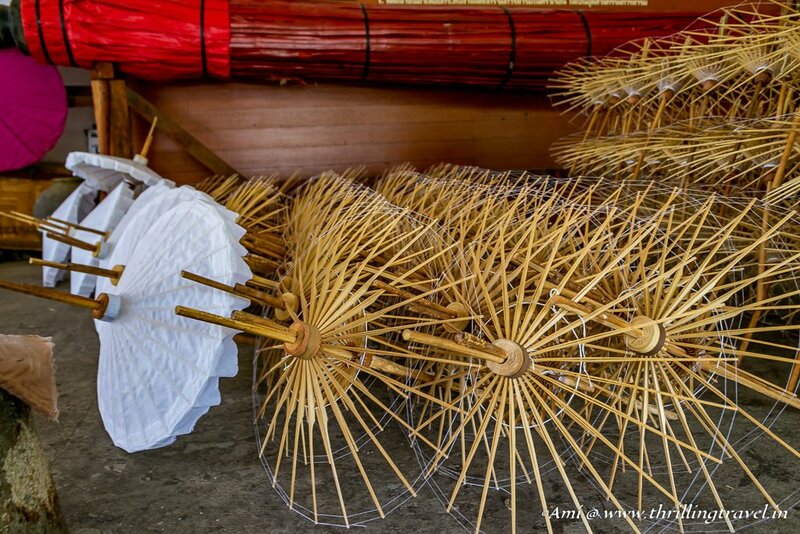 The Bo Sang Umbrellas were essentially made from Bamboo and Hand Made Paper – called Sa Paper. The exotic designs on the Umbrella were hand-painted. Earlier, natural colors were used for the same but these days, acrylic paints had replaced those. The Bo Sang Umbrellas were largely used for protection from the Sun. However, they were far from being dainty. Sa means Mulberry. 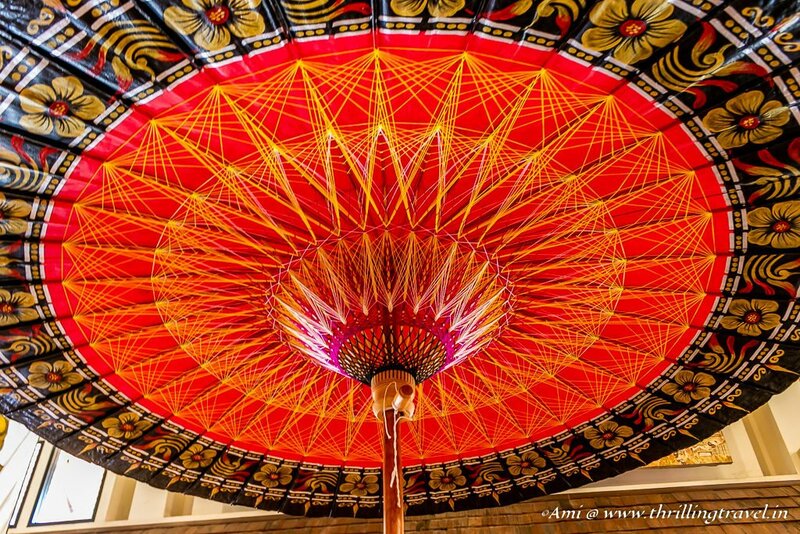 The sail of the Thai Umbrellas is made out of Mulberry pulp. The bark is cut and boiled first. The pulp is then, washed and beaten by hand. After this, it is immersed in a tank of dye and solvent. A large sieve is used to pull it out and this is then dried under the sun. 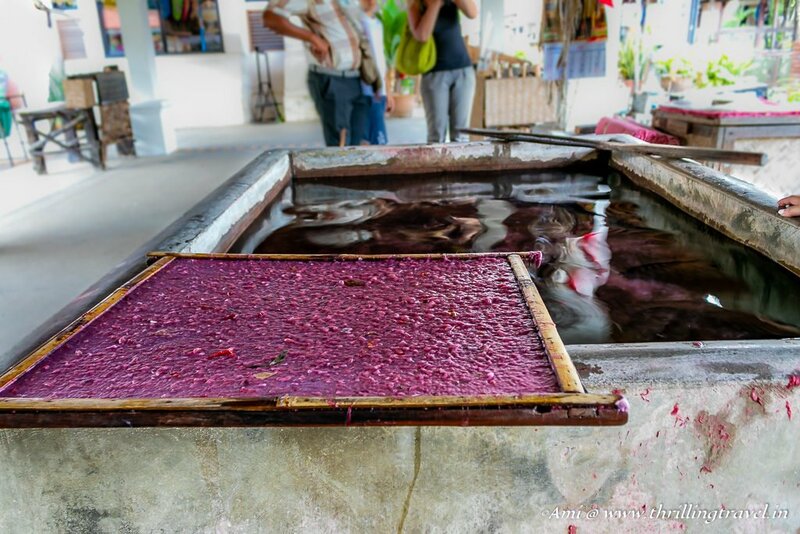 The dried paper on the sieve becomes like a large parchment that can be peeled off. 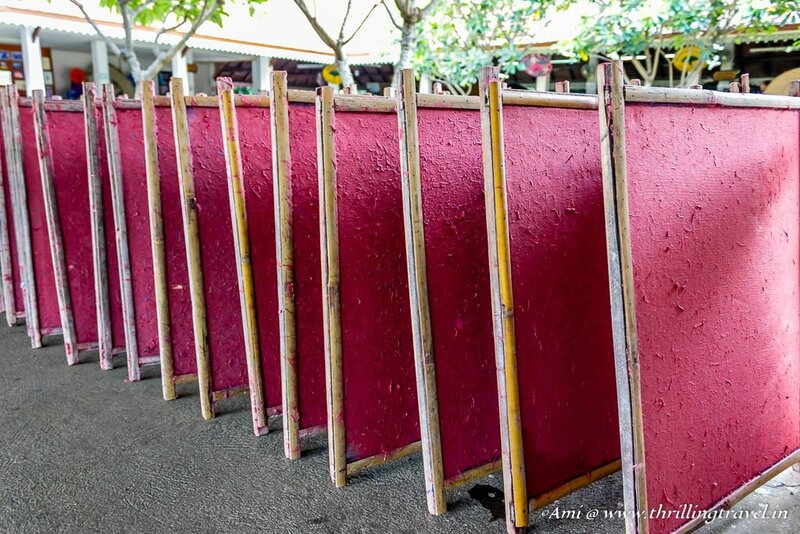 This is what becomes Sa Paper or the Thai art paper – which is then cut out for the Thai Umbrellas. The making of Sa Paper is just one part of the whole Umbrella Making process. The other important part is making of the wooden skeleton. Bamboo wood is used to create this. 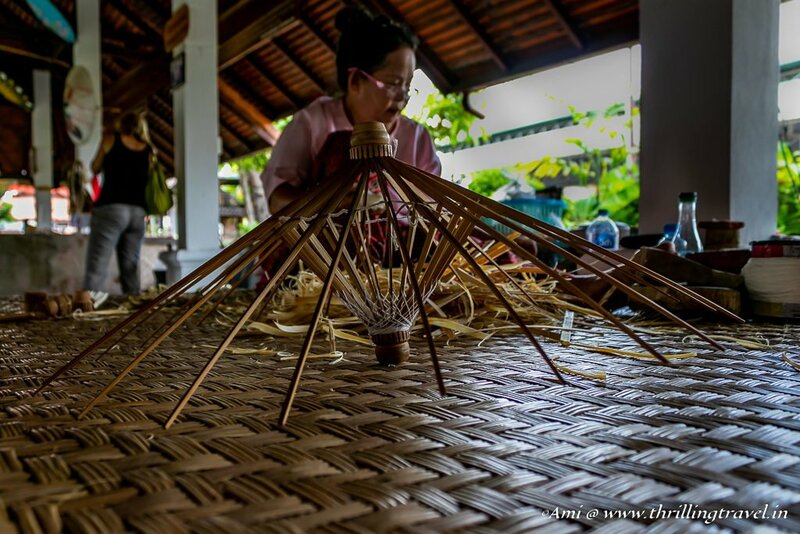 As I walked along the corridor of the Bo Sang Umbrella Center, I saw several Thai women cutting the Bamboo wood into pieces, chiseling them to the sizes required and sifting them into bundles of similar length. While some ladies did the above, the others used the bundles to bind the spokes of the umbrellla using threads. The thread work done around the spokes was not some random binding. It was done in a fashionable manner, such that they add a certain beauty to the whole Umbrella – especially when you see underneath it. The ladies made the whole process look effortless but trust me, it was not easy cutting those pieces by hand. And even more difficult doing so with a smile. With the Sa Paper ready and the Umbrella skeleton done, the next step involves assembling the two together. The spokes are covered with a cloth first and then with Sa paper. The umbrella made is left in the Sun for drying after which it is ready to be painted. Watching the artists work on these umbrellas is quite a mesmerizing experience. The designs were largely floral but here and there, some people were painting an entire landscape onto the umbrellas. Some of these designs made these umbrellas so exotic. They are like a piece of art that needs to be kept under a spotlight. The painting is not easy as the artists make out to be. I know so as I attempted painting one of those umbrellas. Or maybe it is my non-existent painting skill that made it difficult. 😉 Either way, at the Bo Sang Umbrella Center, you can be a part of the busy assembly line by signing up to paint your own umbrella. The activity is a paid one but quite a fun one. It does make you realize the efforts that go into creating those masterpieces. Done with my painting stint, I had to wait for my Umbrella to dry. I took that time to wander around and see their little shopping center. It is here that I found a unique exhibition of Umbrellas from different parts of the World. You can see a double capped one from Taiwan, unusually shaped ones from Japan and pentagon shaped one from China. The dome-shaped one right in front reminded me of the royal umbrellas I saw at the Mehrangarh Fort in Rajasthan, India. It sure was fun comparing those to the ones in the Bo Sang Center. The rest of the Umbrella Making Center is like a small mall that is decorated with the Bo Sang Umbrellas. 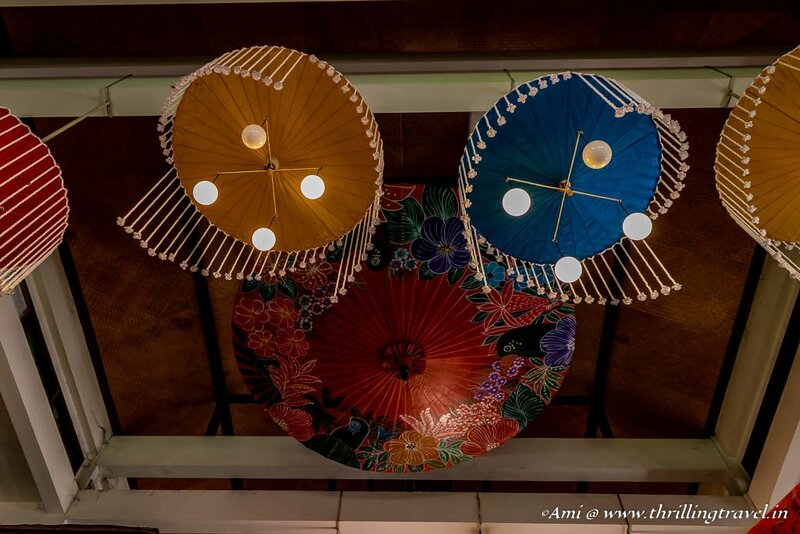 Look up at the ceiling and you will see the lamps in those Umbrella shapes. From handheld fans to large beach umbrellas, there are enough of these beauties to pick from. You can even get some lovely mobile covers with the same designs or picture frames with the Painted Sa papers. The one thing that I found admirable here was that from the scraps that were left over, the center made cute fan magnets. Something that I am sure even with your low budgets, you can afford to carry back home. At the end of this visit, the one thing I realized is that the Bo Sang Umbrellas are just timeless art forms that these villagers are keeping alive with their labor. No doubt that the Umbrellas are pretty enough to entice you to buy them but this temptation doubles when you see how it is made literally from scratch. The natural materials used for each one of them makes them environment-friendly – making it another reason why this art needs to live on. 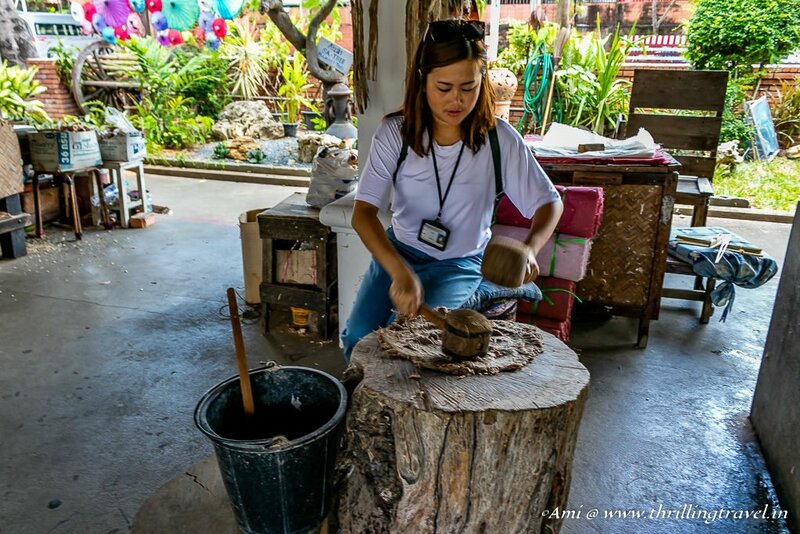 This post is a part of my Art and People Section that focuses on encouraging traditional arts and crafts of a destination. Chiang Mai is well connected by road and air to Bangkok. There are several low-cost flights into the city. Bo Sang Village is just 30 minutes by road (10 km) from the City Center. 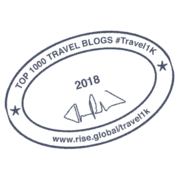 You can hire a private cab or get into one of the local cabs called Red Songthaew (Red Truck) or the White Songthaew to Bo Sang. The Songthaews are generally available around 30 – 50 Thai Bahts. The Red Songthaews can be flagged down anywhere – even close to your place of stay in Chiang Mai. However, the White ones will have to be caught at near the Flower market in Chiang Mai. For a return, you can just flag them down near the Bo Sang Village. Click here to get the Bo Sang Umbrella Center on your phone. The Bo Sang Umbrella Village is open from 8:30 am to 5 pm every day. The shopping at the Chiang Mai Handicrafts Center is fairly reasonable. However, it is all fixed price and you cannot bargain here. The villagers of Bo Sang Umbrella Center do not speak much of English. It is best to converse with them using a local guide. Also, if they are busy with work, it is best to not disturb them as they do not take kindly to it. There is a fun-filled Bo Sang Umbrella festival that takes place in the third week of January. 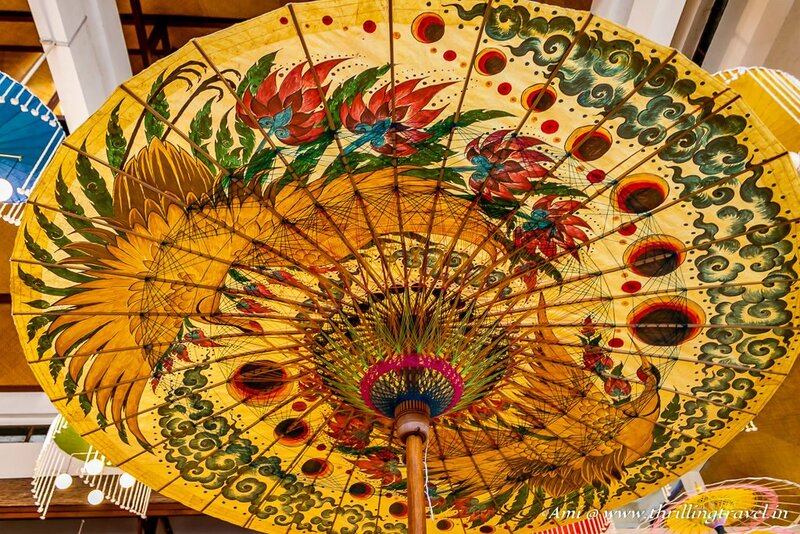 The festival showcases special umbrellas and while you watch those, you will be entertained by some lovely Thai dances. You can even try out the special food stalls during the fiesta. P.S: I visited the Bo Sang Village as a part of my Thailand Trip organized by Tourism Authority of Thailand, Mumbai and Lonely Planet Magazine India. 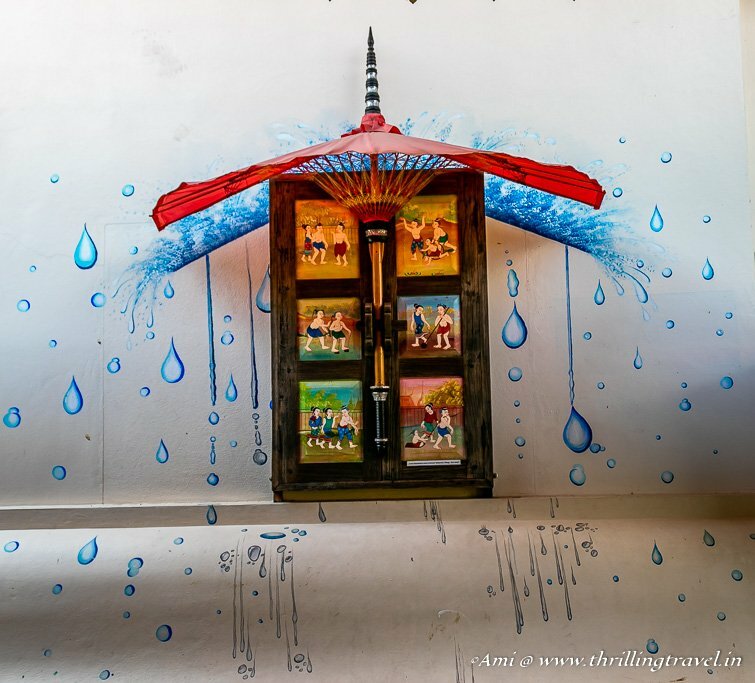 The Post is filled with riot of colours and all the love from Bo Sang umbrella making center. I love visiting craft villages so much.You have provided all the information about such traditional art form of thailand.I The painting on umbrellas are such eye soothing and they are just colourful!! would love to visit it. This is fascinating! I’ve always wondered how they make the umbrellas look so beautiful, and thanks to your post I now know 😉 I went to Chiang Mai a few years ago but completely missed this place. I really want to go back anyway, but will definitely visit the Bo Sang village when I do. You’ve inspired me! Glad you are planning to visit it the next time. Trust me, you will love seeing how they are made. It is quite fun. Hey this is a nice documented piece and loved the narration. Thanks Anindya. Happy that you liked the article. Awesome Umbrellas. Nice to read about the village. Chiang Mai seems so astonishing and a must visit place, Ami. I enjoyed reading your post. I’d love to learn to make these charming umbrellas! Thank you. 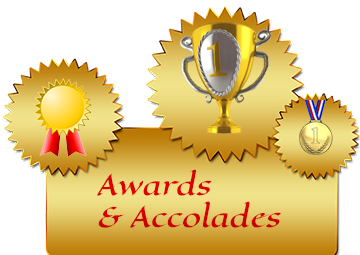 I am happy that you enjoyed the post and hope that you can visit it for yourself too. I am so glad that you mentioned that you need to support these arts. Truly, a small thing to give back as a traveler. Those umbrellas are beautiful! I really want one for myself now! I love the way you told this story, especially the care with which you crafted the photographs and connected them to the text. Our daughter is running through Thailand right now and I think she might matriculate in Chiang Mai in about a week. She loves parallels and would be enthralled with the handicraft village. We’ll be sharing this article with her for sure. Thank you so much for that praise. I hope your daughter can visit Bo Sang. I am sure she will be enthralled. I would love to check this place out but what has really caught my eyes are the decorations of the umbrellas. 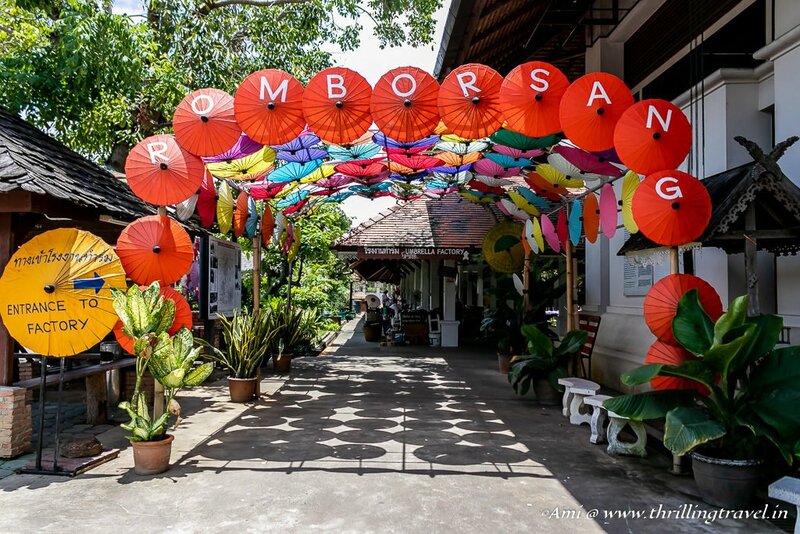 Beautifully written post and I am hoping to do Chiang Mai next year, if so, i am there! Fingers crossed that you make it there soon. Thank you Danik for the lovely compliments. I have seen them making mulberry paper in Thailand, but had no idea that it was used to make these colourful umbrellas. Great story about the monk teaching the villagers the skill. The umbrellas are gorgeous! It is looking such a creative post and you are explained your post in details, which is very easy to understand. Thanks for sharing this attractive pictures and this post. Thank you. Glad you enjoyed my experience through my post and I hope you can visit this place soon. I have always admired the artistry of parasols, but didn’t know much about them. I really enjoyed reading your post! It’s wonderful to get to see the whole process, from creating the mulberry paper, through building the skeleton, and finally the decoration. Great pictures! Oh I loved reading this! Love to hear the history behind these umbrellas – how Buddhism and Myanmar were part of it – and how Bo Sang made it their own industry. What care and attention that goes into these! So beautiful! Thanks for taking us through a unique story- their craft – their culture. Thank you Dorene. It was fascinating to discover it myself and having done it, have a new found respect for this art. 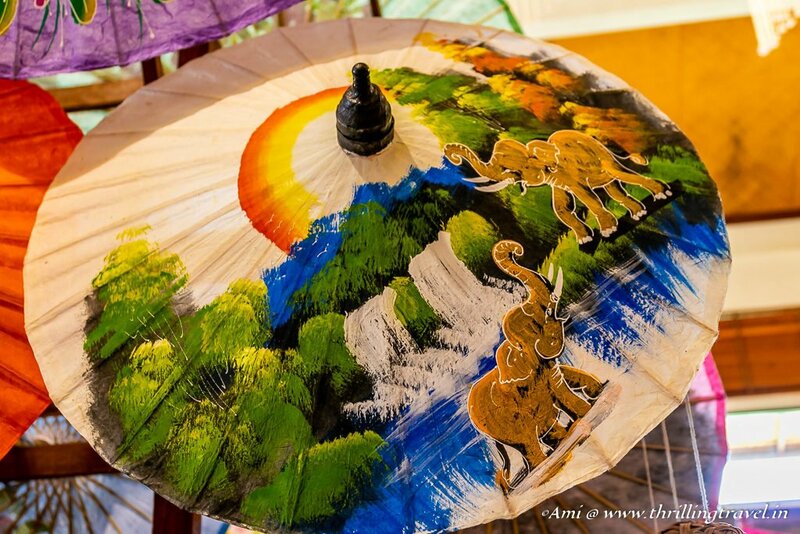 I am now familiar with Chang Mai umbrellas – so colorful, spectacular actually. It’s amazing how a town can latch onto a craft and have it be their livelihood for centuries! 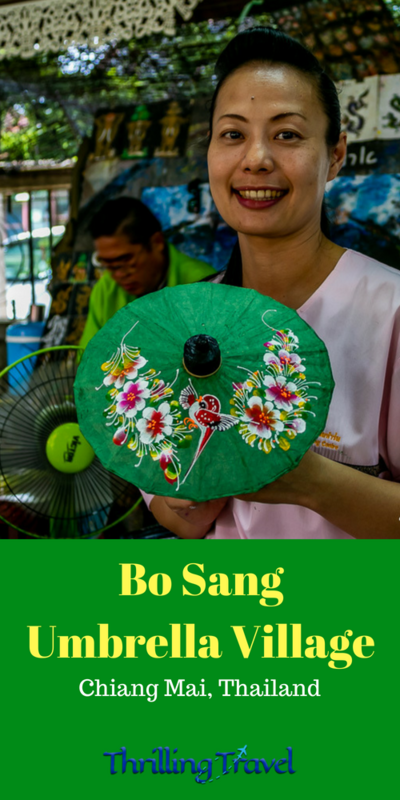 Umbrella making in Bo Sang sounds like an intricate process. 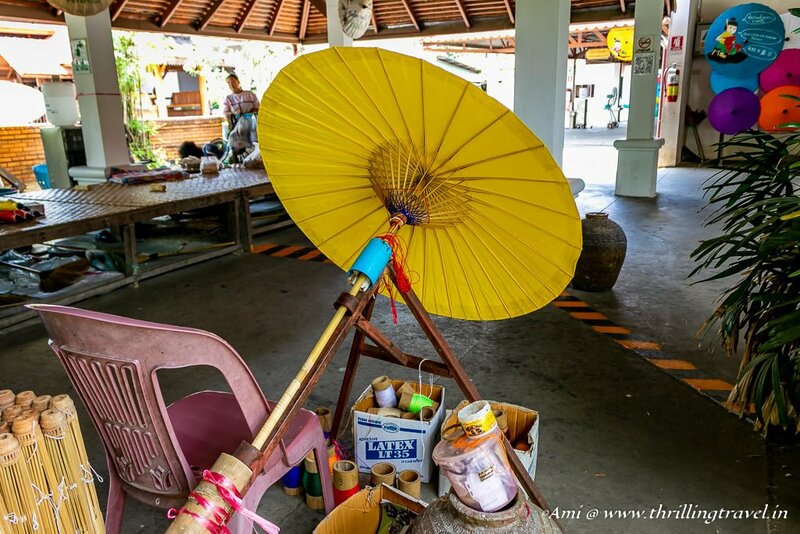 What a great souvenir – a Chang Mai Umbrella that you make yourself! I am so glad that you too seem to like the journey of this art. It is the story and the way it is made that makes it even more invaluable. Bo Sang umbrellas must be a lot of work to do: some of these patterns are rather uneasy to do. I must check this out when in Chiang Mai, it is always nice to see something typical and handicraft. Oh yes, each stage of that umbrella is hard work but it is only when you see it, you realize it. Definitely think you should visit the village. I don’t recall seeing any Thai women with umbrellas like this when we traveled around Thailand. Maybe it’s just in Chang Mai, which we didn’t go to. The umbrellas look like giant versions of those little colorful paper umbrellas that come in tropical drinks. 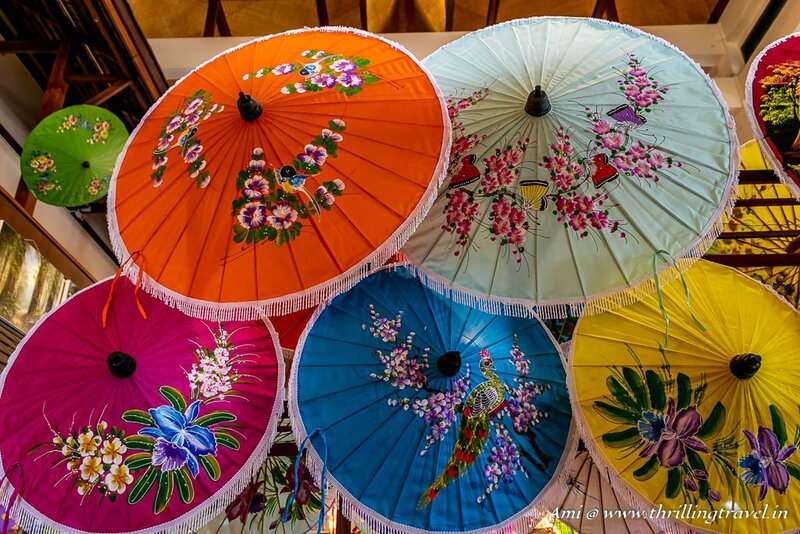 Ha ha – you don’t always see them but am sure you spotted these umbrellas in the curio shops around Thailand. They definitely catch your attention – the umbrellas. They sure are a riot of colours! The Bo Sang umbrellas are the prettiest ones I have ever seen. They have a fascinating history too. Quite a meticulous process to make them, but the results are mind-boggling. Did you bet one for yourself? You are sure to create a sensation on the Bangalore roads, if you step out with one of these colourful umbrellas. I’ve always find these parasols cute and very attractive too! So cool to finally know where it originated! 😀 Interesting to know that they can be used on rainy days too. I’ve always thought of them to be used only for dry season and for decoration purposes.. The umbrella surely is a work of art! What a comprehensive post on Bo Sang Umbrellas. I have heard about these famous umbrellas. Interesting to note that it can save you from a mild drizzles because of the oil based coating. Would sure love to own one. 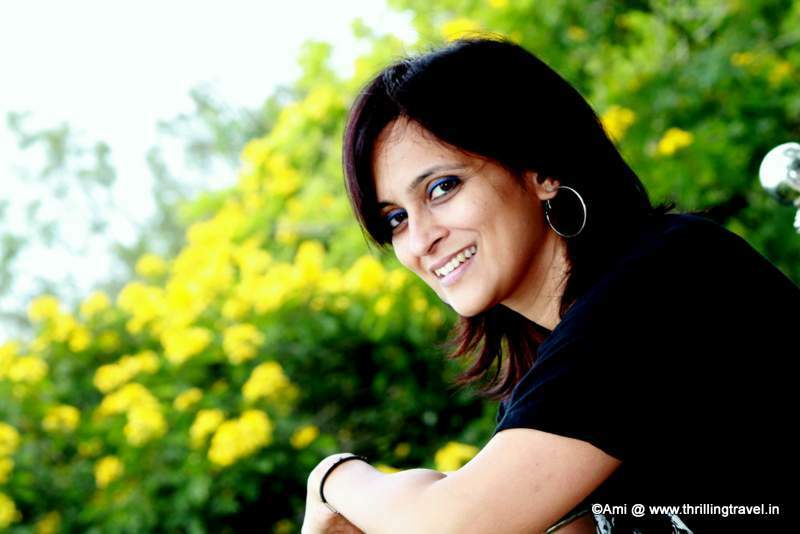 Nisha – you will love visiting this place too. Trust me, the experience here makes these umbrellas come alive. The umbrellas are beautiful! It’s always nice to learn about a culture from their handicrafts. I had no idea you could make an umbrella out of mulberries! The artwork is stunningly gorgeous! I can’t wait to get back to Chiang Mai and visit! Thanks for sharing. Thanks Stevo. I do hope you can visit this place soon. It always makes a difference when you see the art in progress yourself. Those umbrellas are really gorgeous! I’m glad that these kind of handicraft centers are open to the public so that visitors know the amount of effort being put into creating them – which is not easy! It also creates awareness on environmental sustainability like the need to preserve and farm mulberries that is used to make the pulp. Well said Danial. Visits like these definitely promote some sustainable tourism. I hope more and more people attempt to do this. I kept saying, “oohh!” with each photo! They are all very pretty! I especially loved the picture of the ceiling! Thank you Kirstie. That does make me feel good. I love stories like these where you can trace out the history of a local craft. It is lovely that the parasol craft is flourishing in this little village. We need to pick up a few pointers from them and revive some of our traditional crafts which are dying away. If you get to Chiang Mai, make sure you get here. Am sure you will love each one of them, especially after seeing the labour that goes into it.